Having had a good friend from Saudi Arabia back during my university days, I have always been intrigued by that region of the world. Curiously enough though, I wasn’t collecting games during that portion of my life, and Mashari and I were too concerned with meeting girls to worry about something as trivial as Famicom. I never did ask Mashari about gaming in the Middle East, and this made the chance to talk with a collector and gamer from that region even more exciting for me. My initial introduction to the gaming world in the Middle East would be from a few seemingly minor points mentioned in trade correspondence with another collector in regards to some Sachen games he was selling. The European collector (name withheld for privacy reasons) had been selling 72 pin Nintendo NES Sachen games, and I wanted to try to clear up the mystery as to where those cartridges were initially marketed. 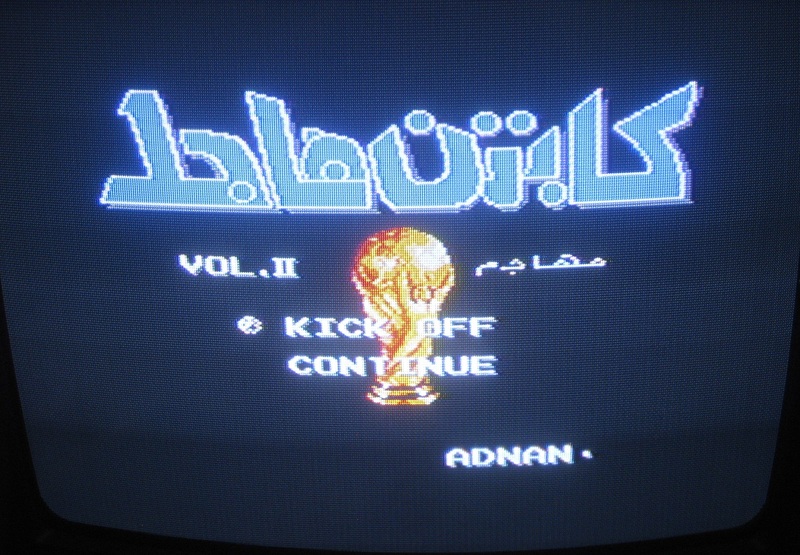 When asked if the games were being sold in Italy during the early 1990s, the seller replied saying “Sachen games I saw some sellers starting [to sell in] 2005…we are speaking of Arabic people specialized in selling cheap electronics / used electronics and the games coming used from North Africa.” In a message a year prior, he had also mentioned that how “10 years ago I purchased to a sort of Arabic market 50 carts all together, all of them were new despite some were [being] sold without box (those I wanna sell now).” So to sum it up, Sachen NES carts were being sold in Italy at Arabic markets back during the early 21st century. Ironically enough, this was also around the time that the games were being imported en masse in the United States by game collectors and resellers. While interesting in its own right, and opening up more mysteries than it solves about the Sachens, I hate to admit that I have gone off on a tangent already, before even getting started properly. People selling games at an Arabic market in Italy have little to do with the actual gaming scene in the Middle East. Now if you’ll excuse me, while I go off on one more tangent, which has a bit more to do with the topic at hand. This past summer I had received a Famicom clone from a gamer buddy in the Netherlands, who always amazes me with his generosity and knowledge (thanks Patrick!). Well packed in the same package as some of those keyboard education Famicom clones I had reviewed several months back was something called the “Home Computer 3600”, a generic-looking Famiclone. The bad part about this machine for me was that it is a PAL machine, but I really like the box art, which feels reminiscent of an old Atari console box. The machine itself is nothing to write home about; it is a generic-looking Famiclone that has been stylistically designed to mimic a real Famicom. The included light gun feels incredibly cheap, though the controllers are nice since they are detachable, something I feel is an upgrade compared to the legitimate Famicom hardware. Going back to the box, I love the text is mostly written in Arabic. 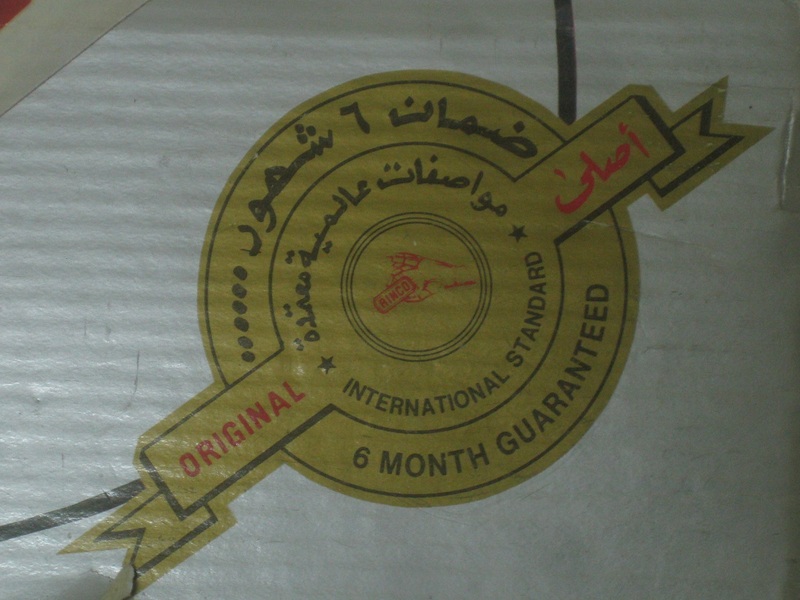 You can even see the company’s seal of quality, which you can examine in closer detail below. 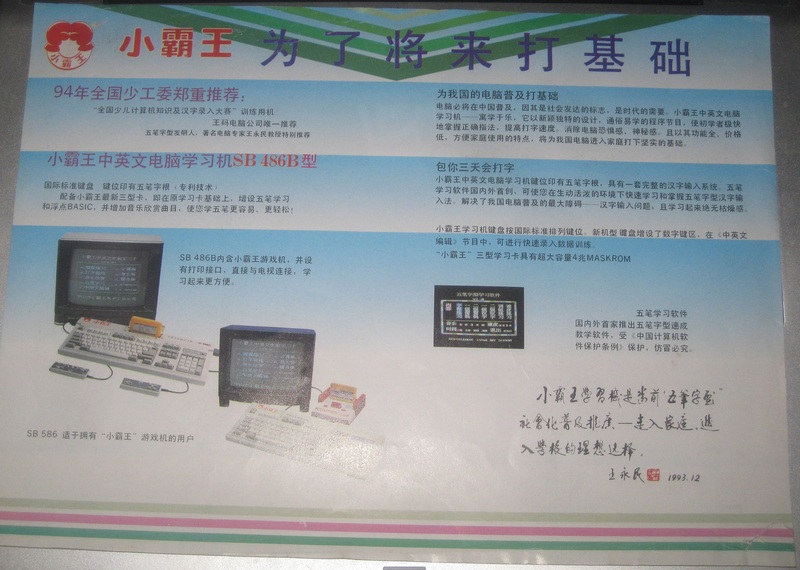 As you can see, the company guarantees the quality of their Famiclone for six months. But wait, what company was responsible for the production of this Famiclone? The answer should come as no surprise, namely Rinco. 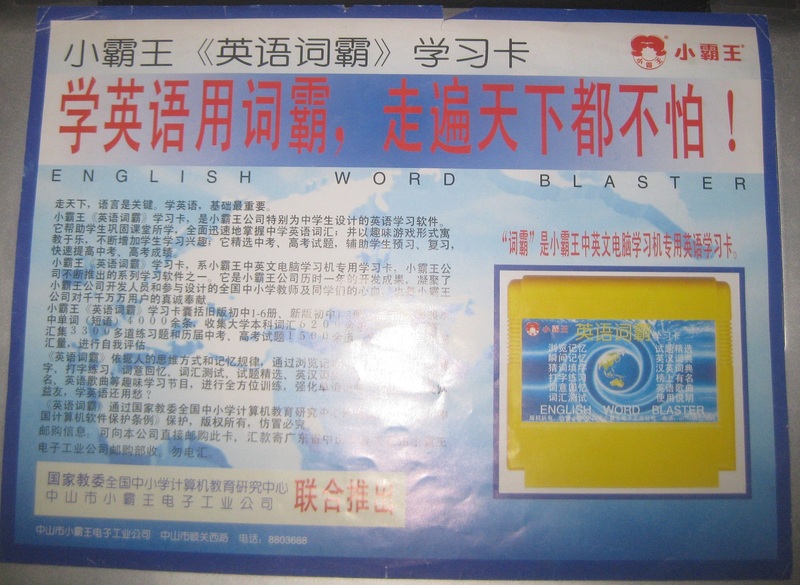 Rinco was a Taiwanese company that expanded its operations to mainland China during the early 1990s. 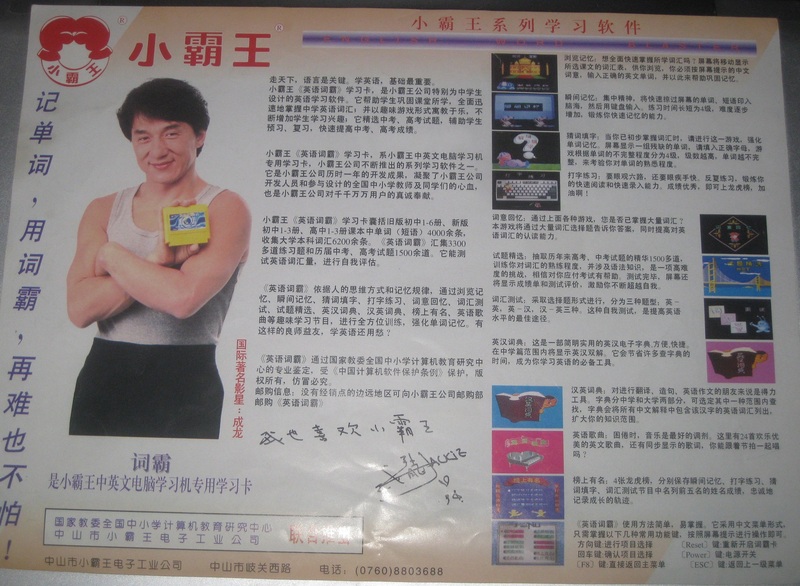 In addition to manufacturing Famiclones, Rinco received most of its fame in the collector’s sphere as the publisher of The Dragon, aka Lee Dragon, an unlicensed beat ‘em up game featuring Bruce Lee. Lee Dragon is quite a difficult game, but in my mind it is noteworthy for two reasons. First of all, this game has a language selection built in, with the choices being English and Arabic. Given Rinco’s dealings in the Middle East, it seems quite likely that plenty of copies of Lee Dragon were exported to the Arab world. Secondly, it is worthy of a mention that Lee Dragon is thought to have been developed by some people, who used to work for Sachen. Maybe Rinco had something to do with distributing Sachen games in the Middle East, though at this point it is only one possibility churning around in my mind. And that is enough talk about Rinco too for the time being. Last summer I had the pleasure of talking with a Saudi Arabian gamer, and he had mentioned the following to me: “I have sweet childhood memories with Famiclones made by Rinco | Home Computer. 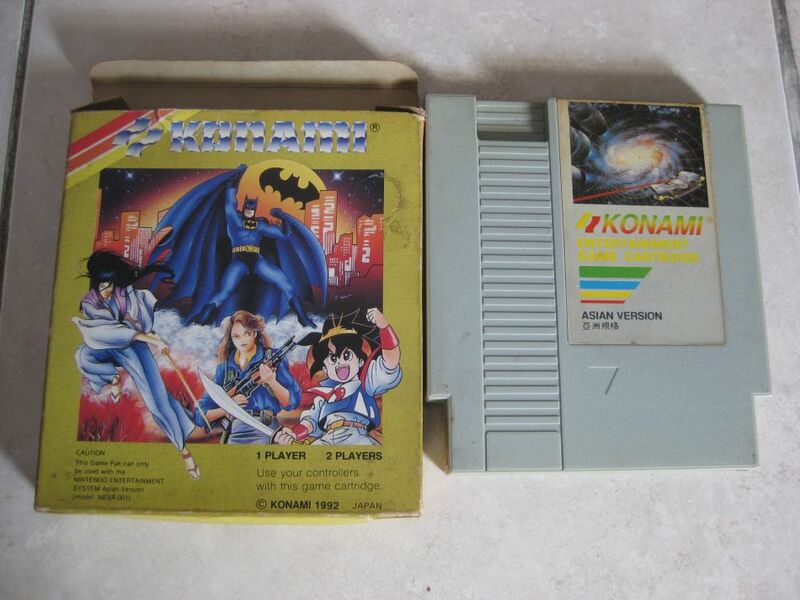 The unique [thing] about them that every one has a copy of Captain Tsubasa, “Captain Majed here” [with an] Arabic translation, and some of them have games like Castlevania, Megaman, [while] others had Jungle Book, Captain America and The Avengers and Aladdin and such.” Captain Tsubasa must have been quite popular since it received its own Arabic translation. Today, while I was out and about, I picked up the above cartridge, along with some others. Normally I am not a big fan of multicarts, and this one looked particularly generic so I had low expectations as to its contents. But as I was purchasing some other games, I hated to leave this one behind, so I decided to take the gamble and purchase it anyway. 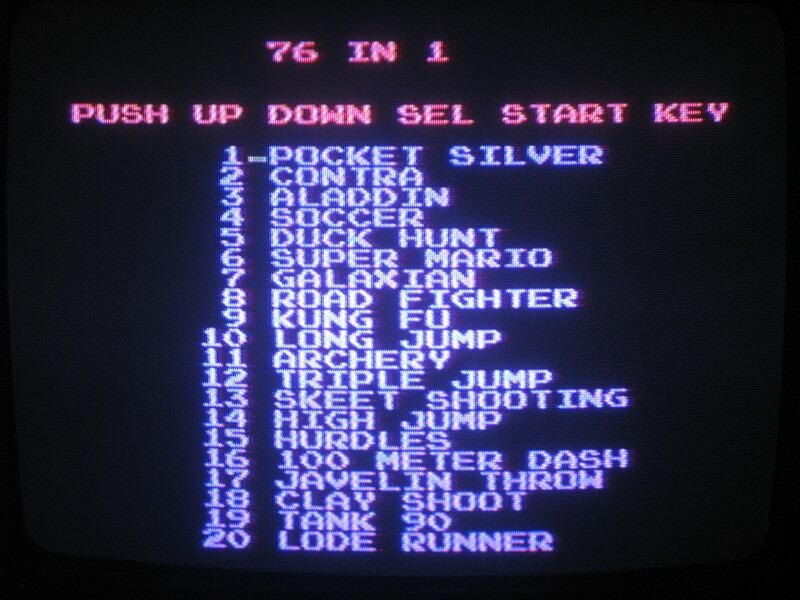 When I loaded up the cartridge I was greeted with the following generic menu. The game list basically met my expectations, so I felt neither happy nor sad. I figured I might as well see what games were on the cart, since I wasn’t able to discern all of the games based on the titles. When I selected the second game, Capitan Majio BDE, a crazy thought briefly crossed into my mind. Could it be? Noooo, it couldn’t be…well yes, it could. And it was. 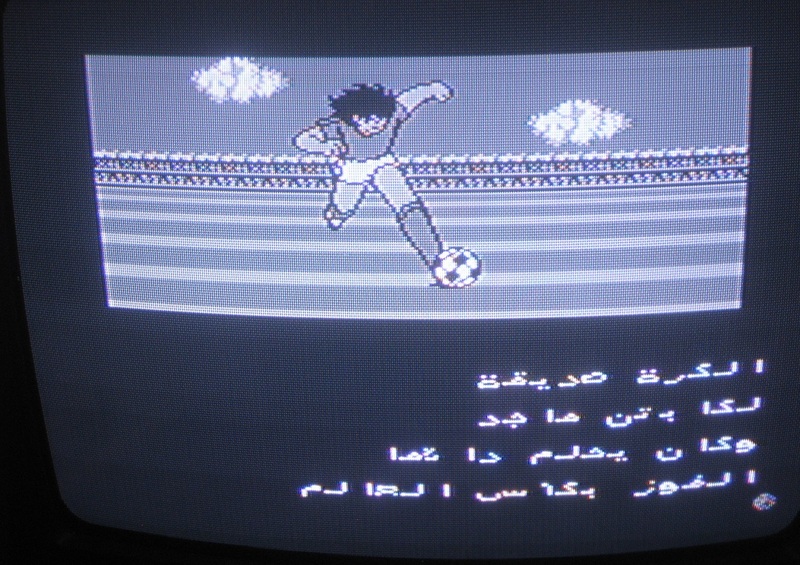 Here we have Captain Tsubasa Volume II, translated into Arabic. 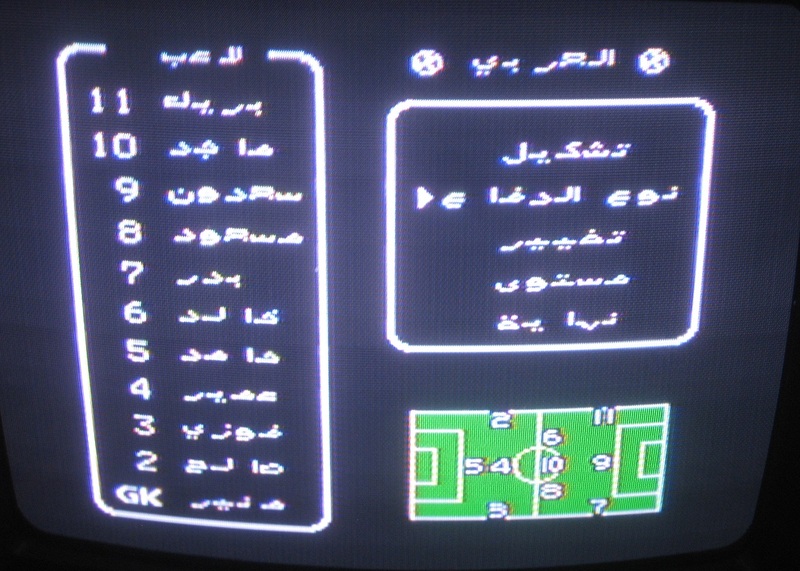 It turns out that this is the original Arabic translation of the game, translated by Adnan around 1995. At this point it is unknown whether Adnan had translated this game of his own choosing, or at the request of a game publishing company. 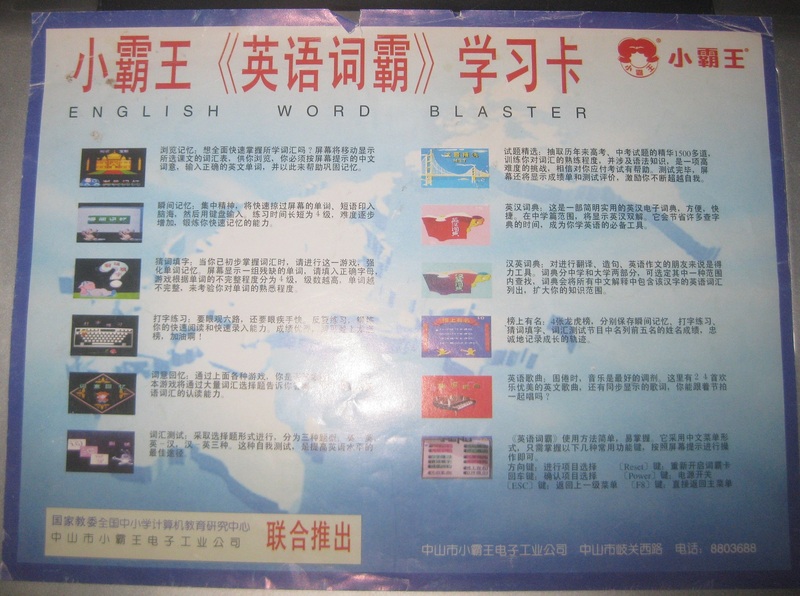 What is known, though, is that his translation would later be revised and distributed as a ROM patch in 2006, under the name of ExtraOrdinary. 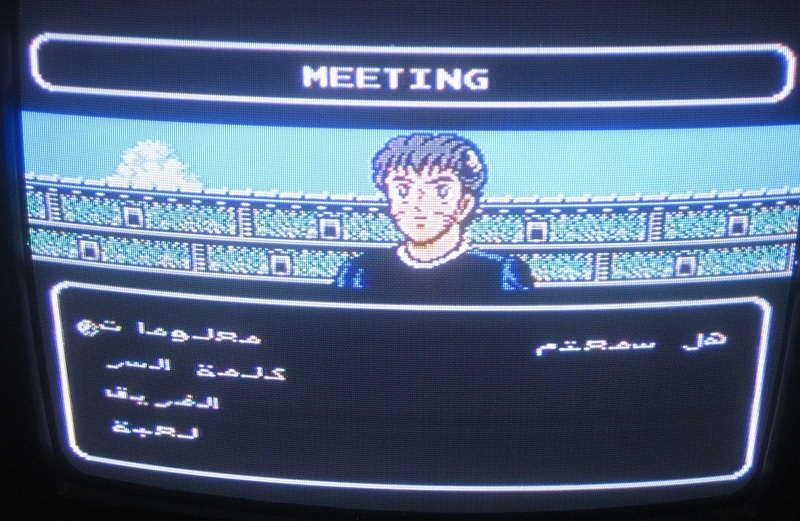 To make things a bit confusing, it seems that another gentleman named Mahmood S. Lattouf also took it upon himself to translate Captain Tsubasa Volume II into the Arabic tongue; however, the Lattouf translation is newer and is not the original one that had circulated around the Middle East during the mid-90s. Two weeks ago I became temporarily under house-arrest, thanks to the sudden realization of a dream. For the longest time I had wanted to own a pet cat, and I had been in talks with my girlfriend about this. A few weeks back, we visited an adoption agency on a whim and when we had gone in, I could see in my girlfriend’s eyes that we weren’t leaving without one of the kitties. And we did. Now being responsible for a two month old kitten, I have been trying to juggle my time between work and tending for him (Richard). In some ways, this has put a cramp in my style – instead of hopping on a random train during the weekend and seeing where I end up, in some town far, far away, I need to stay close to home, so that I can feed Richard his breakfast, lunch, dinner, and midnight snack. On the other hand, being close to the house forces me to think of ways to entertain myself locally, and that is where the Waixing guide comes into play. As a few of my collector / gamer buddies know, I have been talking about writing a guide for the Waixing games since the summer. Since Richard arrived and I was trapped at home, I have been slaving away at designing a catalog of sorts, which attempts to showcase all of their games. 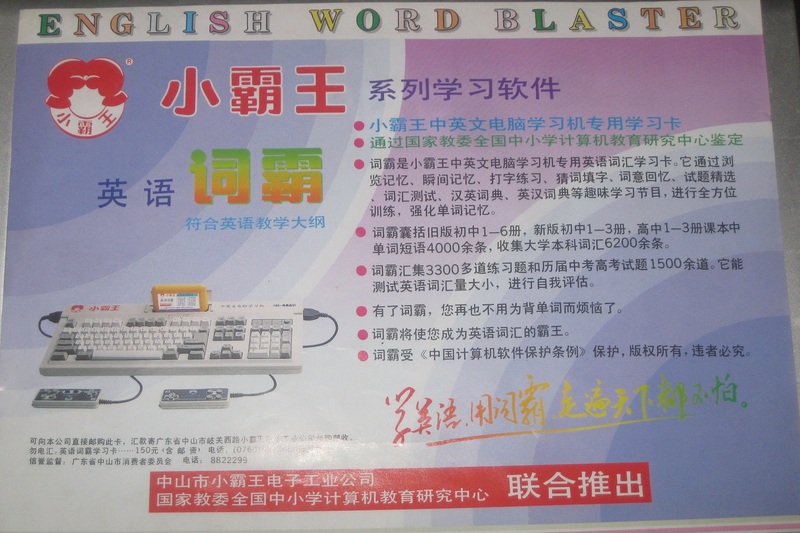 It is a checklist, but I also have hopes of turning it into a guide that will be very useful for gamers too, which have a mild interest in Waixing’s products. I hope someone will find this guide useful, and if you have any comments or information to add, please let me know. Thanks! 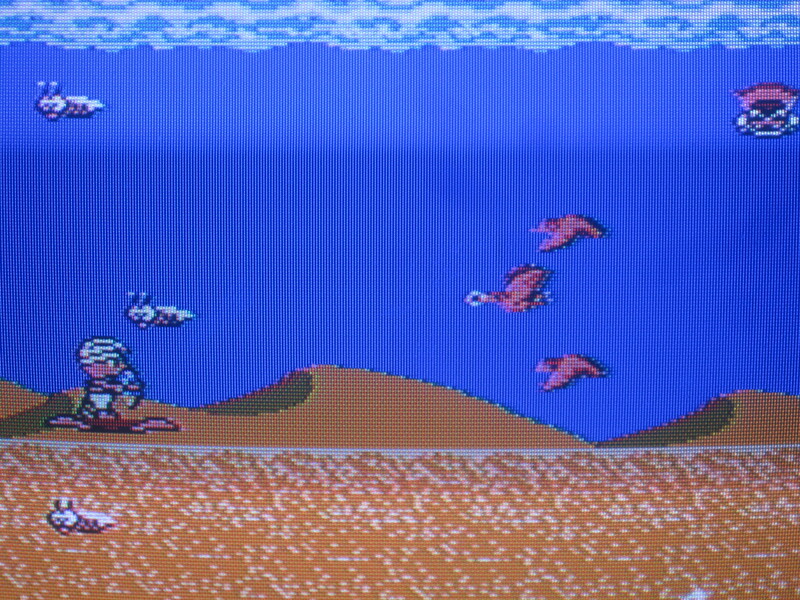 The possibilities with Famicom are endless…and that is why I like it. Unlike its counterpart in America and Europe, the Famicom received more add-ons; the zapper, power pad, and ROB the robot were three of dozens of interesting items. Two or three karaoke peripherals were released on the Famicom, as well as a hammer for playing a whac-a-mole game. 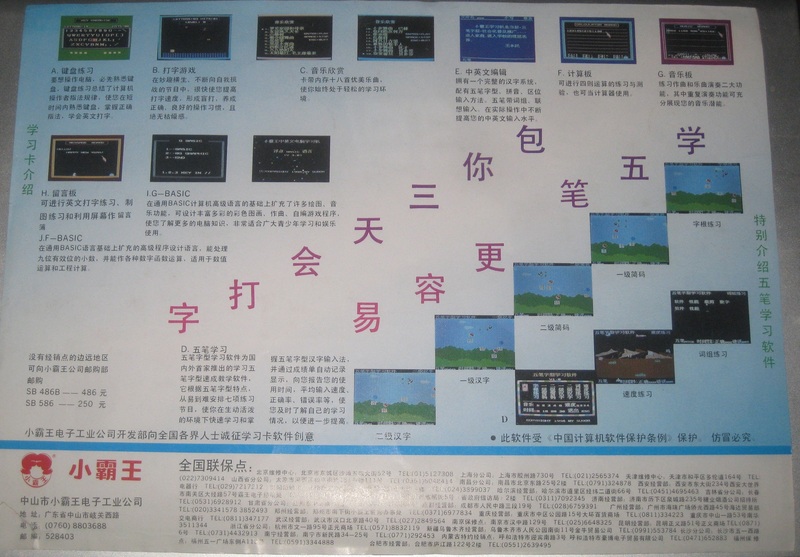 Even some of the mahjong games made use of special controllers. To this day, new items are being created for the Famicom, and that has led to the production of some very interesting items. Remember the dance pad craze of the 21st century? 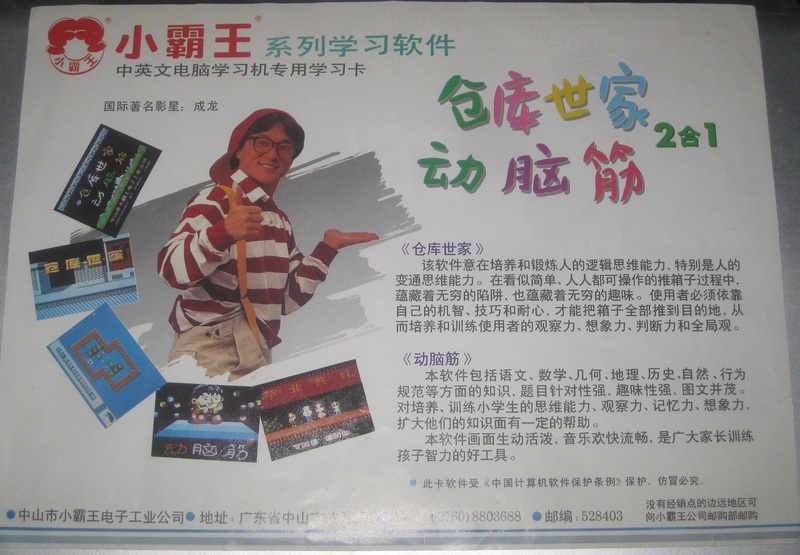 Yup, some companies in China took the liberty to design some dance pads and games that utilized the power of our beloved 8 bit machine. Then there was the Plants vs Zombies and Angry Birds fad. 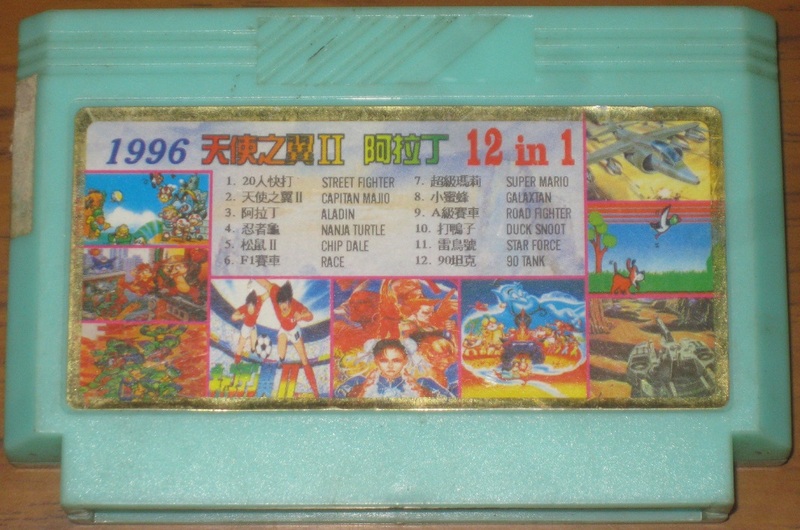 Yup, you guessed it, the Famicom received ports of those games as well. And I honestly wouldn’t be surprised if sitting somewhere, in a sketchy shop situated down an alley in mainland China, would be a cheap guitar controller and Famicom cart designed to simulate the “Guitar Hero experience” on the Famicom. None of these have been found, to my knowledge, but it is only a matter of time. 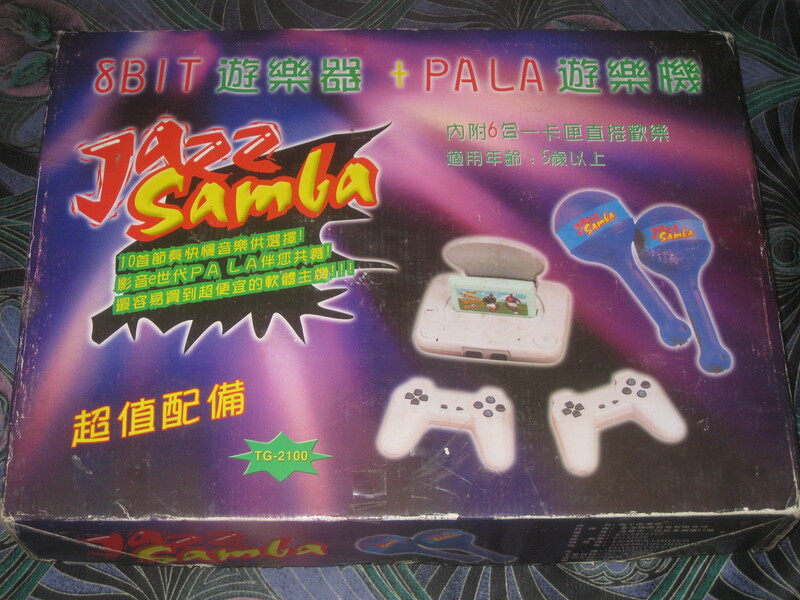 Until then, we will just have to entertain ourselves with other oddities, such as the Jazz Samba clone machine. Awhile back, I had discovered a semi-local shop near me that had some Famicom items for sale. Stopping by one Sunday afternoon, I began browsing through the piles of junk – bras, glassware, shoes, and broken computers, just looking for something of interest. 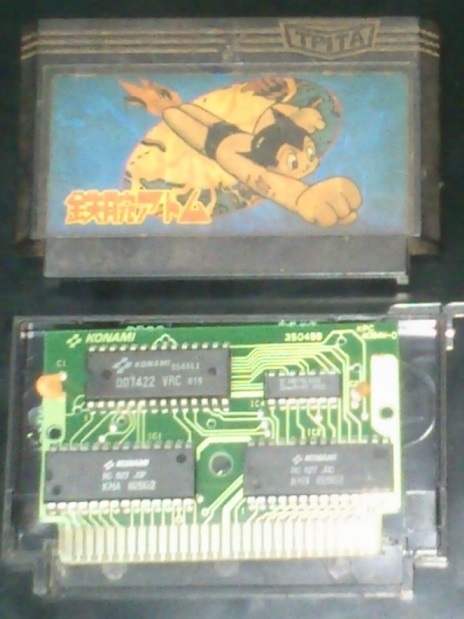 I then stumbled upon something that appeared to be an odd Famiclone of sorts, the Jazz Simba. 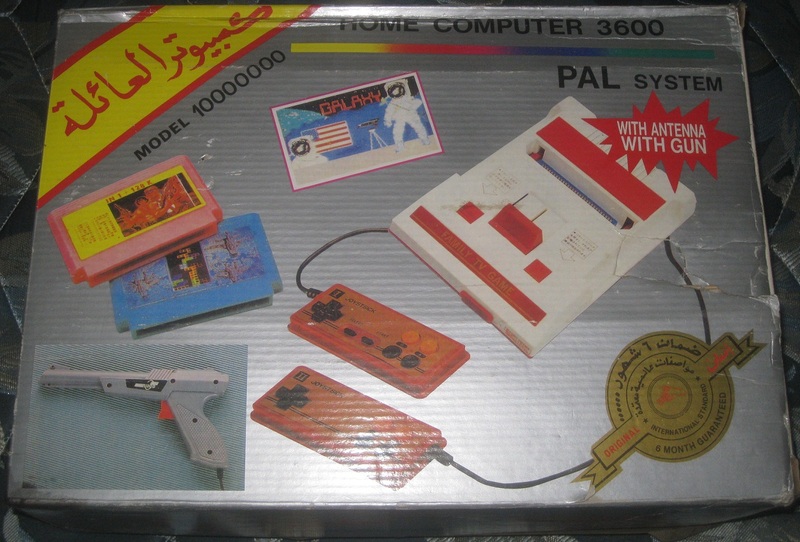 The box showed a cheap-looking Famiclone on the front, as well as some copycat Playstation controllers and a pair of maracas. Intrigued, I immediately grabbed the box and then rushed home to experiment with the Famicom clone. Popping up the hood of this beast, I was greeted with a familiar sight: a generic-looking Famiclone, complete with cables and controllers. To be honest, this wasn’t anything exciting – unlike some of the Asang machines of similar design, this Famiclone didn’t even include any built-in games. Bummer. 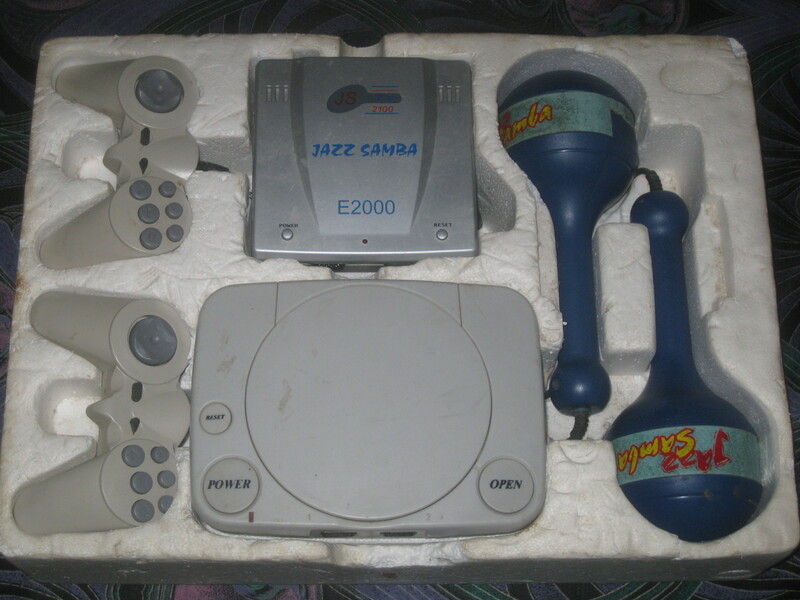 But what about that mysterious box with the words “Jazz Samba, E2000” written on it? Hmm. Mis Amigos, Cha Cha Cha! 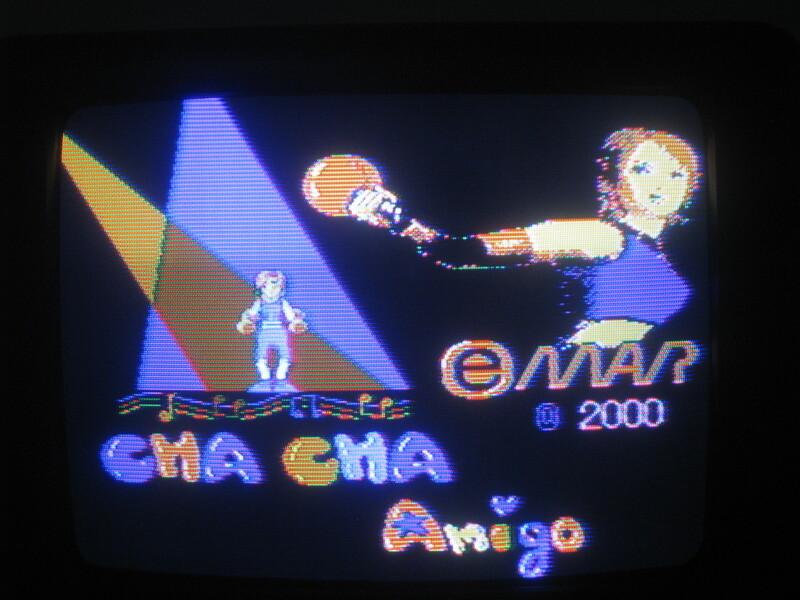 Cha cha amigo, emar 2000. What a surprise, what we have is another Famiclone of sorts. Since the other Famiclone included in the package didn’t make use of included maraca controllers, I guess that maybe this machine will. The woman holding the maraca on the title screen would be the first clue to this, I guess. So I go and get the two maraca controllers, and plug them into the Jazz Samba machine. I then try to awkwardly maneuver the song selection menu using these controllers. Each maraca contains one button…the maraca plugged into controller port 1 allows you to confirm the song (i.e. the start button) whereas the maraca plugged into controller port 2 moves the cursor up and down the song menu. So you need to manipulate both controllers at once, if you want to successfully select any of the 10 songs included in this game. Okay, so then you choose your song. Because I am lazy, I will go with the first song, Long Road. Some catchy music fires up and you are immediately thrown into the game. 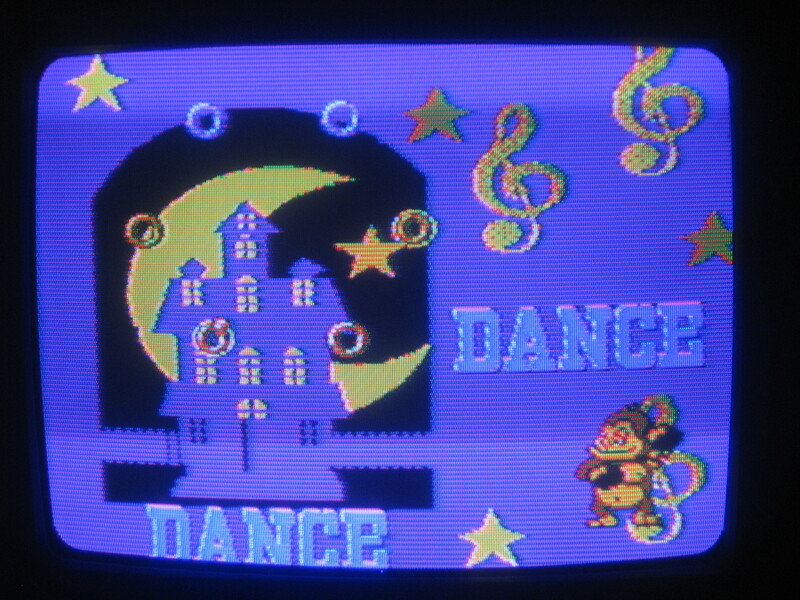 While Donkey Kong dances at the bottom of the screen, small circles float towards the rings located in the upper half. When the ball is inside the ring, shake your maraca and the words “Good” will appear. If you mess up, you will be greeted with the words “Bad” instead. 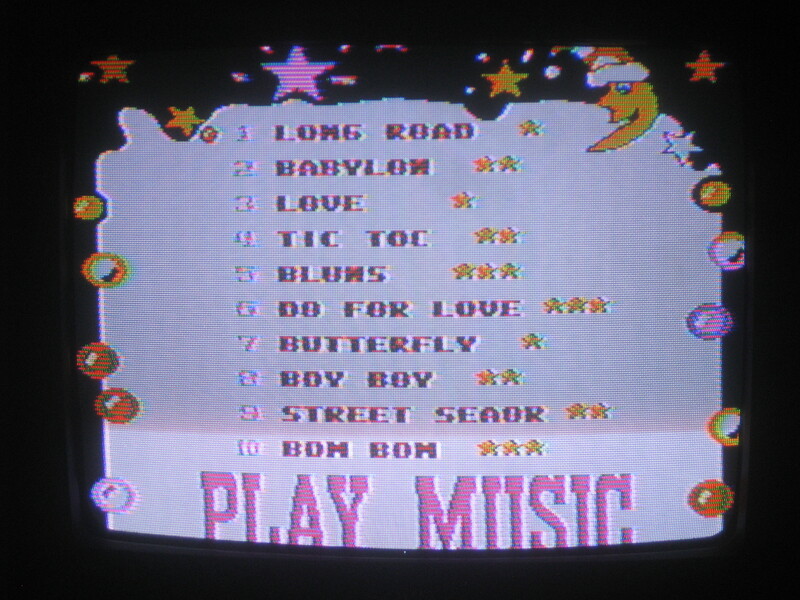 As you progress through the song, the background screen changes. 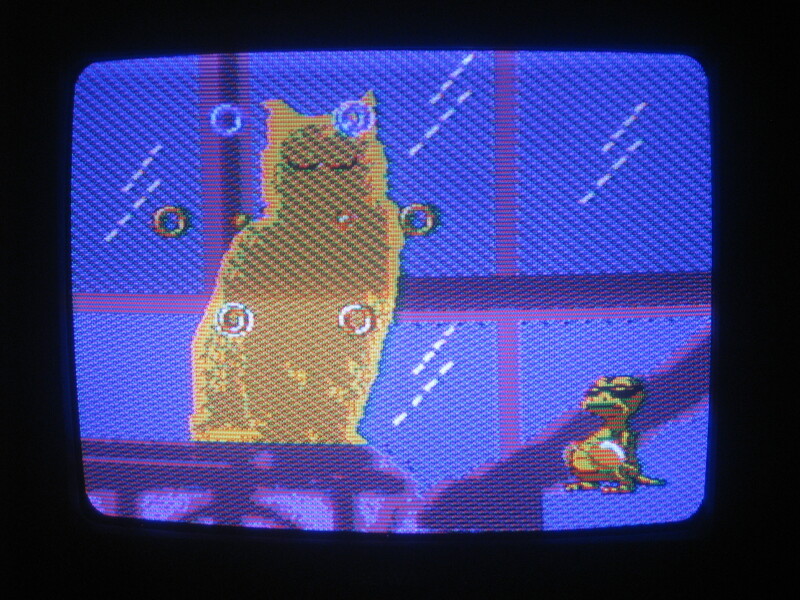 As highlighted by the above example (a different song, btw), the screen changes from that of the castle to one inside the castle, where a creepy cat-owl stands perched on a ledge, ready to pounce. To be quite frank about it, I was sucking at the game in unbelievable proportions. Even though I kept receiving “Bad” marks, the game didn’t shut me out, in the five minutes or so that I played, so I have to wonder if you can actually lose the game from bad performance. Next time I host a party, I’ll have to break out the Jazz Samba and then I can find out the answer to this perplexing question. The truth is that I probably won’t ever be proficient with the Jazz Samba machine. My rhythm is off too much, and I just don’t have the patience or time to kill an hour or so of my life, playing with this thing over and over again. For those that are wondering, I am also one of those stereotypical white guys that looks like he is having a seizure when he is “dancing”. On the other hand, I really like the Jazz Samba for what it represents, for what it truly is: a unique Famiclone that attempts to mimic the popular games of the newer generations. Us grandpas that grew up on the original Nintendo can still keep up with the younger generations, thanks to the Samba machine. Below is a short video of me playing with the Jazz Samba. I would like to apologize for the quality of the video, as well as for the quality of my gaming. Holding the camera with one hand, and two maracas with the other makes for a rather poor gaming session, but at least you can check out the music and get a better feel for the game. Enjoy! A few weeks ago, a man with a crooked smile nervously approached me. “You like Game Boy?,” he asked as he passed a bag of games towards me. “Sure,” I answered, quickly thumbing through the games, “How much?” He gave me a figure that I felt comfortable with, and I extended my arm, cash in hand. Moments later, the games were mine, and I hopped a bus bound for home, as fast as I could. Those games were mine! Among a sea of crappy titles, I did discover a few diamonds in the rough: a Waixing RPG, some Sachen games, possibly a Yong Yong game or two. More interesting though, were the three game cartridges that went with the TV-Boy game machine that I had picked up a few weeks earlier. Like the Cai System from last post, it felt great to be able to find a game player and the proper software, so that I could try the thing out and see what it was about. In design, the TV-Boy is slightly larger than a Game Boy Color machine, though it is also a bit smaller in size than an original Game Boy. 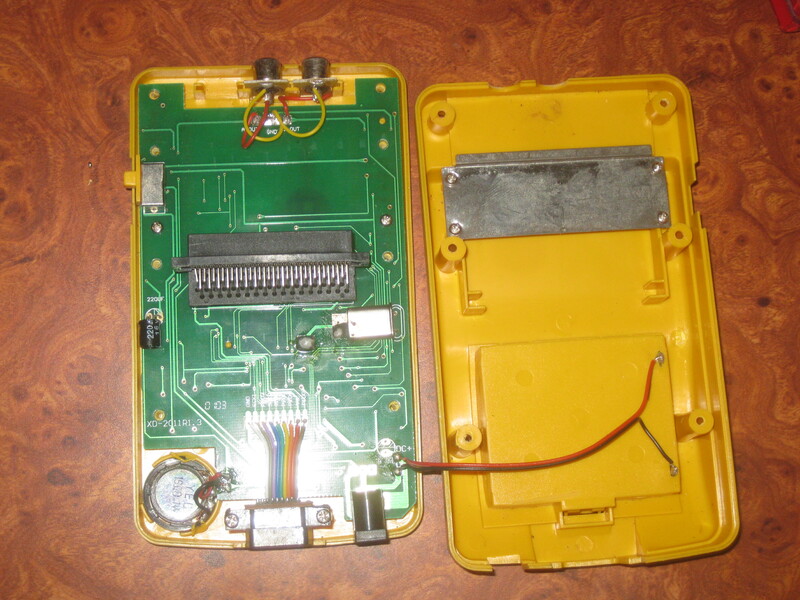 Stealing the design from the Game Boy, the TV-Boy has an LCD screen with a built in brick game. In addition to the generic brick game, the TV-Boy is compatible with a series of cartridges, once again inspired by the Game Boy. 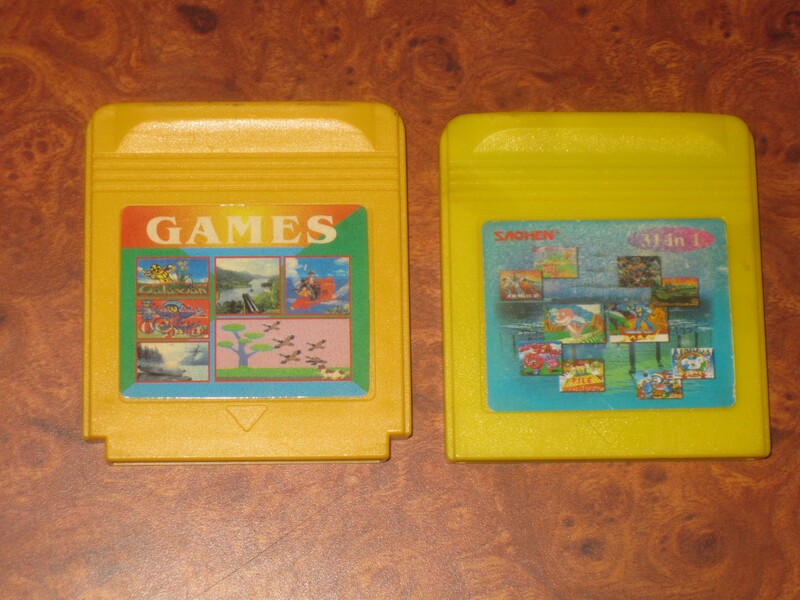 The carts are housed in cases that are quite similar to those used by Sachen for their unlicensed Game Boy releases. 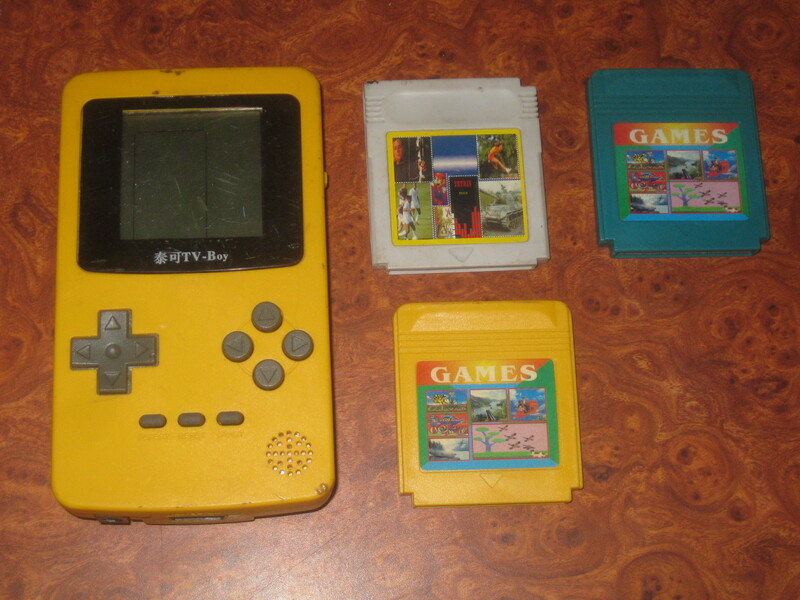 Despite the similarities in size and shape, the cartridges are not compatible between the TV-Boy and Game Boy. 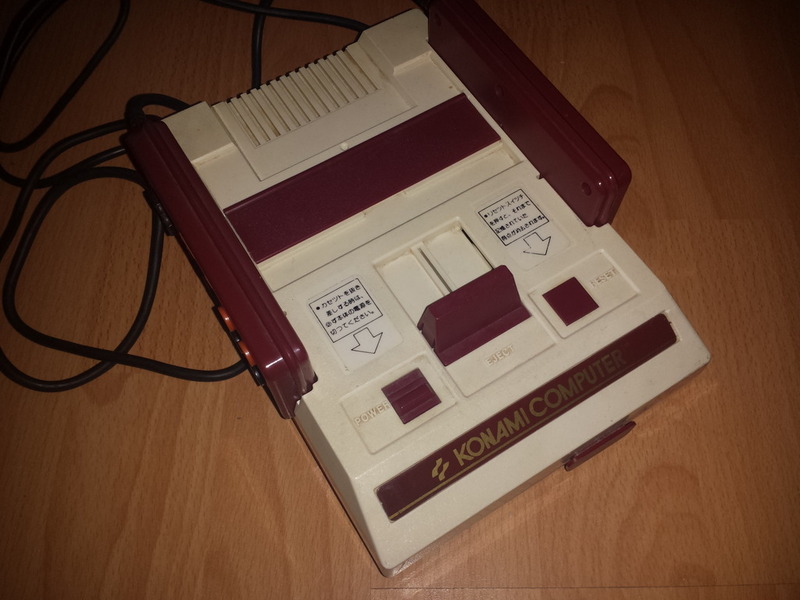 Furthermore, the TV-Boy contains AV ports on top, and a controller port on the bottom of the machine, allowing one to connect a generic 9-bit Famiclone joypad. There is also a spot to plug the TV-Boy into a power supply, or if you desire, you could run the game off of four AAA batteries. 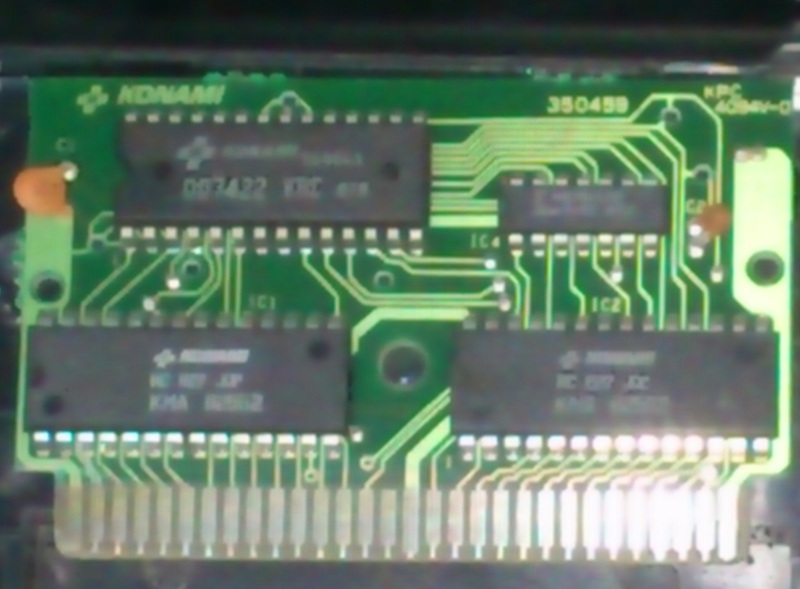 Now that we are done examining the exterior of the device, let’s see what secrets are contained within the game carts. 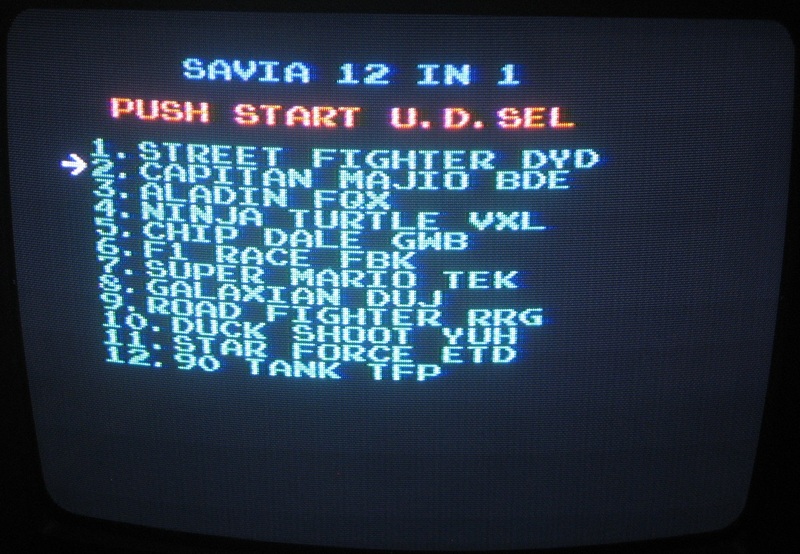 As the first cartridge loads up, something familiar stands before my very eyes: a generic menu with the words “138 in 1” written across the top. 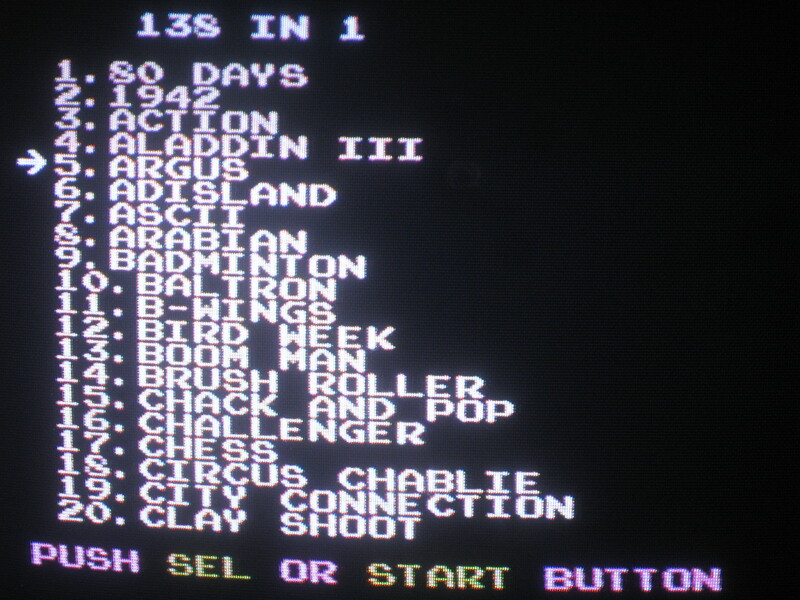 Randomly choosing a game, I scroll down the menu and select “Aladdin III”, which as we both know, is just an alias for Caltron’s Magic Carpet 1001. I quickly sample a few of the other games as well, before ejecting the cart and throwing in the 76 in 1 game cartridge. When this one loads up, we are presented with yet another generic menu screen. 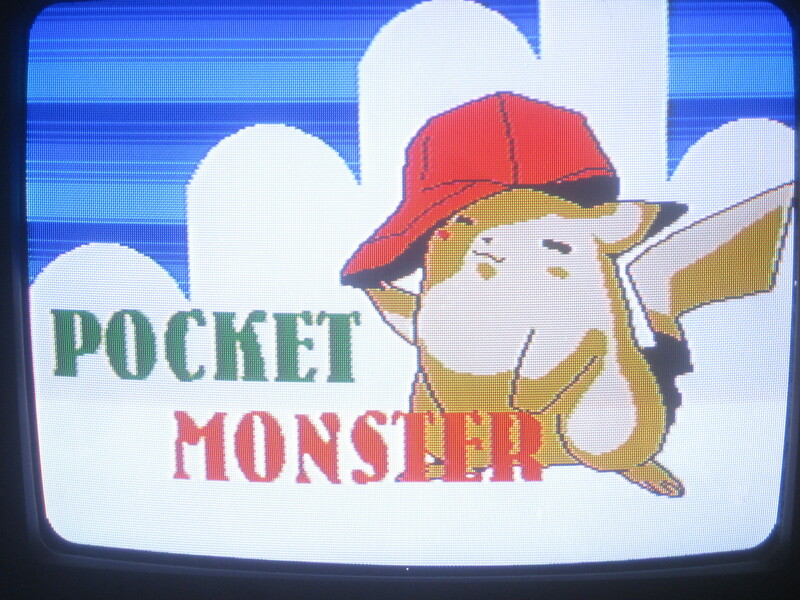 Pocket Silver is an unlicensed original Pokemon game, which sometimes appears on Famicom multicarts. So yeah, are you guys surprised? The TV-Boy is nothing more than a Famiclone, and the game cartridges are just NES multicarts packed into Game Boy-style carts. I have also heard rumors that there is an adaptor for the TV-Boy that allows you to directly connect Famicom carts to the machine, but I can’t confirm this either way.